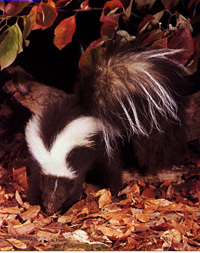 Skunks are located throughout the United States and Canada. They are active during all seasons. They are hunted for their skins. However, a hunter must have a license. Skunks are best known for a bad-smelling fluid they shoot from underneath their tails. They can fire this stinky fluid 7 or 8 times at an animal that does not stay away. If skunks fight among themselves, they never spray each other. However, the only animal who does not seem to mind the bad smell is the Great Horned Owl. This owl hunts skunks at night. Skunks fear no one, including people and cars. Because skunks do not fear cars, you will find many of them killed on the road. Skunks are small mammals. Skunks are one of the most easily identified animals. They have mostly black fur. However, skunks have one or two white stripes covering their backs from head to tail. Sometimes the stripe looks like a white V. The male is usually longer than one foot. The female is a bit smaller. They are between 7 to 10 inches tall. They can weigh between 3 to 6 pounds. Skunks mate during the winter months of February or March. Baby skunks, called kits, take about two months to develop. There are usually 4 to 5 kits born per season. Kits are born blind and without fur. They feed off their mother’s milk for about two months. Then they stay with mother and begin hunting food. Skunks often stay in families for one year. They live about 7 years. Skunks live in dens and burrows. They often share their homes with other animals such as foxes or raccoons. Skunks sleep during the day and hunt at night. They can live in woodpiles, under houses, or sheds. They also live in dens and burrows in the forests. Skunks can swim well, but they swim only to save their lives. They prefer not to be in the water. They do not hibernate during the winter season. Skunks are mainly meat eaters, or carnivores. Therefore, they hunt for large insects such as crickets and grasshoppers. They will also feed on other small mammals. Sometimes, they dig in the soil looking for beetles, grubs, and earthworms. If skunks find bird eggs on the ground, they will eat them. They hunt by smelling for their food. They also enjoy a good meal of certain kinds of garbage from people’s garbage cans. Sometimes, while they hunt, a poisonous snake can bite them. They usually survive a snake bite. Skunks can survive up to 10 times the amount of poison (venom) it would take to kill an animal of the same size.